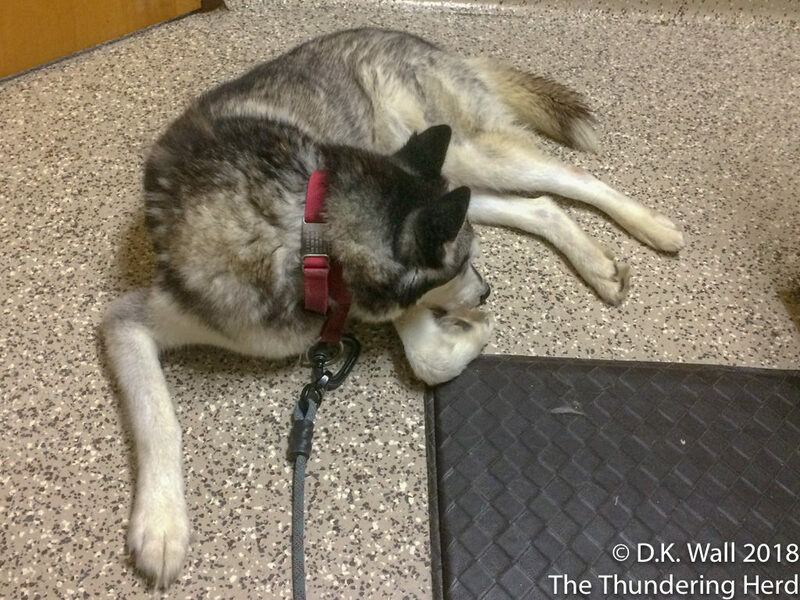 Typhoon visited the vet to treat a hot spot, check his weight, and some other tests. We share the heavy results from his day. By heavy, we mean 57.3 pounds worth of heavy. In April 2017, at the bottom of his battle against digestive issues, Typhoon’s weight had plummeted to 38.8 pounds. His consistent refusal to eat had thrown his body into a terrible state and we were so worried worried we even resorted to intravenous fluids for nutrition. We started him on a steroid treatment, along with other substances, to battle Irritable Bowel Syndrome and spark his appetite. Yesterday’s weight marks an all-time high weight without any obesity. In short, he is finally attaining his proper weight. The weight gain also gives us extra room to continue weaning down his steroid dosage. We may never remove it completely, but any steroid supplement we can reduce will be good for him long-term. So, in this case, our “heavy” results are all very good news. So, I’m done. I can go home, now? Yesterday’s visit was sparked by a hot spot that flared up on his left rear knee (you can barely see it in the photo above) and we added a round of antibiotics to fight an infection. 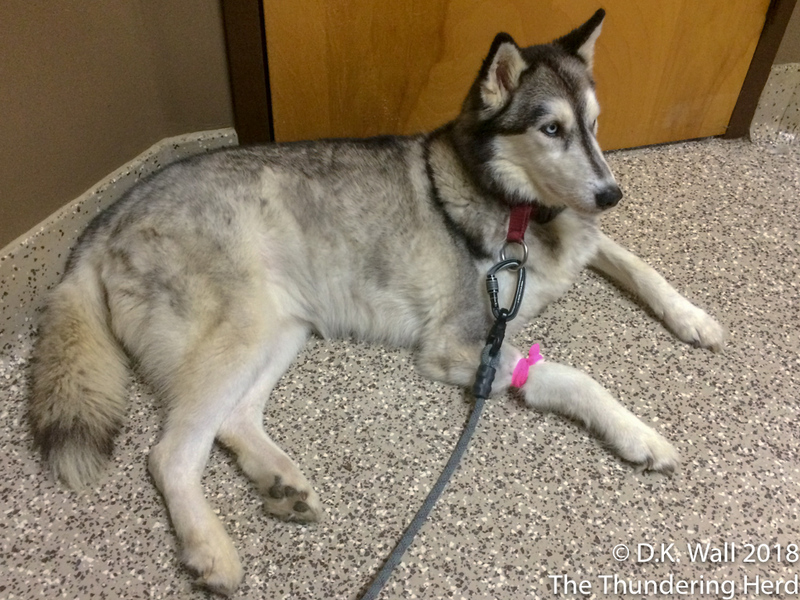 He also willingly (if you count the Hu-Dad and three vet techs holding him as “willingly”) provided some blood to monitor his liver levels (which have been high in the past and the results will be back later). Let’s just say that a dog who isn’t a fan of being touched had a challenging day. I can’t believe you stole my blood. Don’t believe all his tales of woe. He received dozens of ear scratches, spoonfuls of peanut butter, and approximately eleventy-seven bazillion liver treats as offerings to His Haughtiness. That’s GREAT to hear that Typhoon is doing so well! He is a very charming character! My girl, Rory, is also NOT a fan of being touched (except for ear scratches +belly rubs! 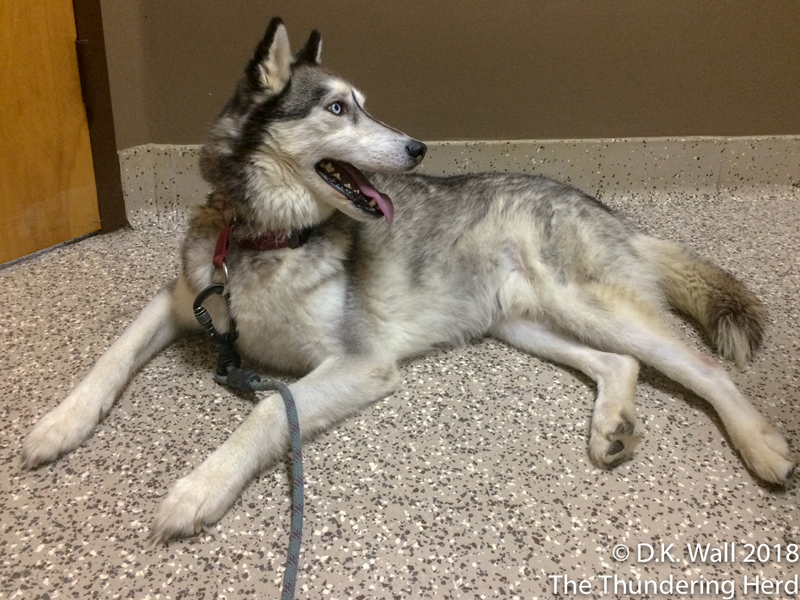 )…and she had to go through CCL surgery/TPLO in March.It was challenging but she did very well and she is making a wonderful recovery!! She is 8yrs old…a red/blonde like Cheesewiz and she is a “rescue” too.Thanks for the update on This! Oh TYphoon-I am SO happy your weight is getting better and sorry your blood got “STOLED”-lol BUT Hu-Dad says you got LOTS of treats and peanut butter and ear rubs so I think you got a good deal!!! I am very glad your vet says you are doing so well and I KNOW you don’t like going BUT Hu-Dad worries about you sweetie!! oh bless you typhoon! you have much mischief to get into yet! you must be in tip top shape for its full satisfaction! we love you! Way to go your royal highness Little Prince!! So happy you have FINALLY got your weight up to ”normal”. We were all concerned. I hope that some day you’ll figure out that ear scratches and belly rubs are a good thing! You are loved Ty-Ty! You may be a ‘rescue’ but your highness has ‘rescued’ a lot of us making us laugh then a smile for the day. Typhoon doesn’t look too unhappy after all the unwelcome attention. He sure has put the weight on and he’s looking good.